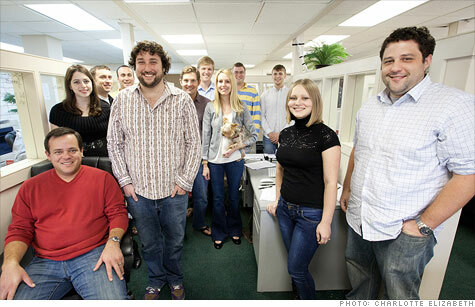 Dan Schneider, founder and CEO of SIB Development and Consulting, (center) stands with his employees, who can get an extra $50,000 if they stay with his company for five years. NEW YORK (CNNMoney) -- One small business owner is putting his money where his mouth is when it comes to valuing his employees. Dan Schneider, founder and CEO of SIB Development and Consulting in Charleston, S.C., is offering $50,000 bonuses to any of his full-time employees who stay with his company for five years. "In this day and age, there is nothing that makes people loyal to companies anymore," said Schneider. However, a $50,000 retention incentive can change that, he said. Schneider introduced the incentive in May and any of his 30 full-time employees is eligible. There are no strings attached, said Schneider. If an employee stays on for five years, he or she will get a check for $50,000. If an employee stays on for 25 years, he or she will get $250,000 in bonus cash. "Most people think I am nuts, and I am fine with that," he added. Cash bonuses are more common among big corporations looking to keep top talent. In the '90s, even some smaller companies jumped on board. However, the majority of bonuses at smaller firms were stock options often granted during mergers and acquisitions, said Colleen Aylward, president of executive recruiting firm Devon James Associates. In these still dicey economic times, Schneider's program is unusual and "a great ploy," said Aylward. People usually remain in jobs two to three years, especially at startups, she explained. Even if SIB employees "don't stay five years, it is a good mental motivation for them." Schneider, a serial entrepreneur, came up with the idea when he realized that training employees is expensive. Indeed. Training can cost a company tens of thousands of dollars depending on the employee's experience, added Aylward. "I can't just bring someone on who knows how to do it," said Schneider. Schneider also realized that a company of happy employees is a more efficient one. When employees "are happy at work, they perform better," he said. SIB combs through clients' phone bills, electric bills, trash bills, and other fixed, monthly expenses looking for opportunities to cut their costs. It only bills them if it finds savings. Schneider helps pay for the bonuses by finding places to cut expenses in his own company -- for example, by buying office furniture on Craigslist from companies closing or downsizing. His cost-cutting measures and business model have turned SIB into a cash cow. In 2010, revenues were $2 million. And for 2011, the firm is projecting $6 million in revenues. Schneider plans to add another one or two employees a month for the next 12 to 18 months. SIB is Schneider's third company. Now 30 years old, he started his first business, a retail mobile phone company, when he was 18. He grew his second company, a wholesale mobile phone company, to $35 million in annual revenues before selling it. After his second company, Schneider took some time off to learn to kiteboard, traveling to the Dominican Republic, Panama, Israel and Mexico. He stopped over in Charleston, S.C., en route to the Dominican Republic, where he bought a condo on the beach. The layover in Charleston was extended, thanks to a delay in construction of his condo, and Schneider decided to lease office space for six months. That was November of 2008, when the recession was in full swing. Companies were eager to cut costs and not long after, SIB was born. No one has received an incentive check yet, because SIB is only three years old. But the bonus announcement is already boosting morale. "It is nice knowing that you have a tangible reward ahead of you if you work hard and do a good job, outside of the regular raises that a normal company does," said Kelly Bogdan, a 28-year-old office manager who has been with SIB since May. She is not job searching. Neither is Jonathan Colao, 23, who recently got his master's in accounting and just signed on at SIB. He was looking at four or five other places when he was job searching, and none of them offered such an incentive. Another employee, Drew McLean, 27, has been working with SIB since the summer of 2010. The cash bonus keeps his eye from wandering professionally. "I am in for it," said McLean. He recently bought a house. "If I got that money, I would be able to pay off a big chunk of my house, maybe buy a boat or something fun," he said.